Expanding PS4 hard drive storage capacity to 2tb has been a common option among a wide variety of users. It’s not only the limited storage space of PS4 HDD (that’s either 500gb or 1tb) that promotes/justifies going for a new 2tb hard drive for PS4. Rather, it goes beyond that to the extent of low performance and untrusted reliability of the PS4 stock hard drive..
Do you know that PS4 hard drive is an obsolete model that has been disowned by the manufacturer itself? Don’t believe it? Ok, have a look at this article. It illustrates how Sony employed a deprecated/disowned version of HGST drives inside PS4 to keep the price tag low. Better performance and solider reliability. That means you’ll trade the old, obsolete and unreliable drive that PS4 is using for a more powerful one. With the new drive you’ll increase the performance of PS4 to a higher level. Moreover, you’ll rarely suffer from drive failure/error that the stock PS4 HDD causes after a long time of use. You’ll get 2tb storage capacity without the need for using an external HDD. Yes, that’s important to some users because internal hard drives are more reliable than external HDDs in various aspects. Extended warranty as long as 5 years. Depending on the drive you pick (We recommend Seagate Firecuda 2tb SSHD), you can enjoy a long warranty that ranges from 2 to 5 years. Improved and seamless online gaming. Because part of online gaming depends on the speed of your hard drive, upgrading to a high performance drive will make the good change here. You may also be interested to read this quick comparison between PS4 extended storage vs internal hard drive upgrade. There are only a few options in the market for PS4 2tb hard drive upgrade. That’s because PS4 only accept a 2.5-inch form factor hard drive for the replacement process. You can, though, get a larger internal hard drive capacity by employing a 3.5-inch drive, but that requires you to obtain an additional equipment called Data Bank. For more details on this subject, please visit this article. Here, in this section, the best PS4 2tb hard drive upgrades are laid out. They implement the latest data storage technologies and offer solid performance that can last for too long. I have picked them based primarily on my good expertise in storage devices. Additionally, I’ve deeply researched the first two picks in the list below before recommending them. You can confirm this by reading several articles on this website that discuss several aspects of these two drives. Therefore, I can confidently say that as long as you’ve identified your needs, you can’t go wrong with any drive listed below. Seagate Firecuda ST2000LX001This drive is actually classified as a Solid State Hybrid Drive (SSHD). It’s a combination of the classical mechanical hard disk drive (HDD) and the solid state drive (SSD). That way, users get the capacious storage space of HDD with the high performance of SSD for a budget-friendly price. This drive is our top pick 2tb hard drive for PS4. With this innovative technology, it offers an unparalleled speed that no drive can beat except an SSD. It’s configured with SATA III interface for a maximum transfer rate, and comes in 2.5-inch form factor with 7mm thickness only. As for the caching system, it supports multi-tier caching. It has 128mb cache buffer in this 1st tier and 8gb SSD in the 2nd tier. That way it can offer its users up to 80% of SSD performance with a vast storage capacity. All of that for a reasonable, budget-friendly price. This drive is also covered with 5-year limited warranty. This long warranty period is only found in SSDs. It indicates how reliable this drive is. For more details on this drive and additional features, please read its review. Seagate Firecuda ST2000LX001If you want an upgrade kit that includes every tool you need to have a smooth PS4 hard drive upgrade process, this kit must be your choice. Fantom Drives Upgrade Kit provides all the essentials you need to backup files, install new components, and reuse the original hard drive. (Convert your PlayStation 4’s original drive into a new portable drive with the included Fantom Drives G-Force portable USB 3.0 aluminum enclosure). The included quick start installation guide provides everything from preparing, removing, installing, and updating your PlayStation 4 to the NEXT level of gaming. By upgrading to a 2TB SSHD, it enables users to download more games, store more data, and increase performance. This Product also works with PS4 PRO, PS4 Slim, and PlayStation 3. Package content: 2TB Seagate Firecuda SSHD, 16 GB Flash drive, Fantom Drives G-Force portable USB 3.0 aluminum external enclosure, carrying pouch, Philips screwdriver, micro USB 3.0 cable, quick start installation guide. If, for any reason, you don’t like to opt for an SSHD, you can go for a traditional hard drive like Seagate Barracuda 2tb HDD. It’s exactly the same drive as above with all features except that it doesn’t have a 2nd-tier SSD caching plus the warranty is only 2 years. Anyway, if you are mainly interested in expanding PS4 storage to 2tb, and the current performance of PS4 Pro satisfies you to the extent that you don’t want to improve it, you can go for this drive and save around $10 only. It’s still a good bargain, as it is faster and more reliable than the stock PS4 Pro hard drive. With it you can enjoy 2tb of storage space on your PS4 without the fear of running out of space any sooner. This is our top recommendation for PS4 2tb SSD upgrade. It comes with the lowest price in the market and with a high performance that suits game consoles like PS4. I don’t strongly recommend using an SSD for PS4 and I have my own valid reasons for that (read more). But, on the other hand, using an SSD in PS4 is still a popular option, especially among enthusiasts. This drive comes with 2tb storage capacity. It’s configured with SATA III interface, and designed in 2.5-inch form factor with 7mm thickness. It’s low price is the first factor to pick this drive over other SSDs. That’s because game consoles don’t really need very high performing drives to get to their peak performance level. Just any SSD can unleash the maximum power of your PS4. You can get it for less than $300 if you pick the right seller (see the image below). Designed in 2.5-inch form factor in order to fit inside the PS4 drive cage. You can also use a 3.5-inch desktop hard drive for the upgrade using an equipment called Data Bank. But then that will have additional costs on your budget. Configured with SATA interface. Other interfaces, such as mSata, PATA and SCSI are not accepted. That’s because PS4 motherboard only support SATA drives. Not thicker than 9.5mm. That’s because the height of PS4 drive cage doesn’t allow thicker drives. Not larger than 8tb capacity. That only applies to SSDs, as currently the largest 2.5-inch hard drive is 5tb. That’s it. Once you have a 2tb hard drive that meets these specifications, it will fit as a PS4 HDD upgrade. Is 2tb storage capacity enough for your PS4? Or larger is better? If you want larger, try to compensate the loss with an external hard drive. Choosing between SSHD, SSD and HDD is primarily depending on your budget. A 2tb SSHD is the best option for the overwhelming majority of PS4 users. 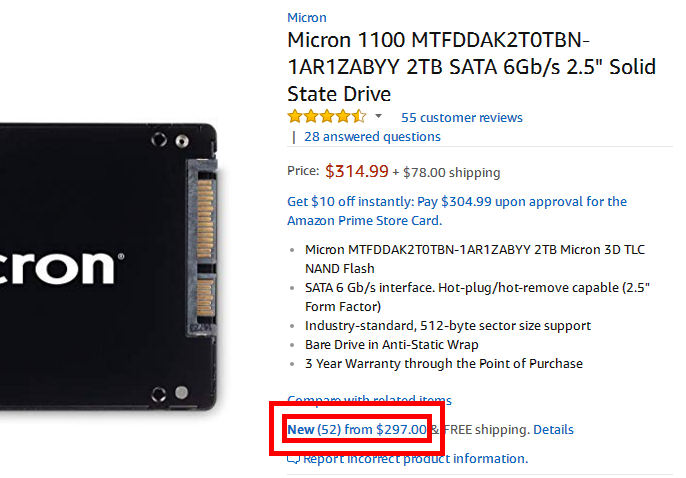 You can go for 2tb SSD if you wish though. But remember that you won’t get the same blazing performance as that happens to a computer. Having a PS4 2tb console is nice, but you need to know how to manage that large storage space. If it’s too large for you, try to go for 1tb SSHD if performance is your concern. So, once you have decided and picked a compatible 2tb hard drive for PS4, be ready for upgrading PS4 storage. Once you have picked the right 2tb hard drive for upgrading PS4 storage, you need additional special tools. When everything is ready in hand, you can start with the upgrade process without any worry. A screwdriver compatible with PS4 in order to open the hard drive cover. It must be a Philips-head screwdriver, and a good recommendation is Kingsdun T8 T8H Torx Screwdriver. A compatible USB flash drive. You’ll be using this flash drive for installing PS4 System Software from scratch. An external hard drive enclosure to help backing up your data from PS4 HDD. You’ll have to use this enclosure on both drives, the new and old one, in order to get the backup-restore process going right. So, how to start with upgrading PS4 hard drive with the new 2tb drive? Please keep reading. Probably now you’re excited to start upgrading your PS4 hard drive with the new 2tb drive you have chosen. But before going through the upgrade steps, you need to make sure to download the latest version of PS4 System Software (The full package NOT the update patch) and store it on your USB flash drive. To backup your data from PS4 HDD, use the external HDD enclosure on the new 2tb hard drive. Now you’ll have an external hard drive to where you will backup your games and applications. To learn more about how to set up an external hard drive as a backup storage for PS4, click here. Warning: Make sure to turn off electricity on PS4 before moving on. Now you are ready for the upgrade. Watch the video below and carefully follow its instructions. I have been always recommending PS4 users to replace their game console’s hard drive with a new, modern drive. My first concern was performance, but that doesn’t prevent me to suggest a storage expansion as well. Opting for the best 2tb hard drive for PS4 is not a difficult job. All you need to know is how to do it right. Gauge your needs with your budget and figure out exactly what suits you. Eventually, it’s always good to have a 2tb PS4 console that helps you dispense with any external storage addition. It will boost your PS4’s performance and you’ll have a drive that’s much more reliable.